A new report by Burning Glass Technologies indicates that the need for STEM graduates may be much larger than previously reported. Of job postings in the STEM fields in 2013, 2.3 million of the postings require a bachelor degree in a STEM field for entry level positions. Yet, in the research literature and popular press there has been push-back on the “STEM Agenda” focus of encouraging high school students to pursue STEM majors and careers, and that there should be equal or more focus on the social sciences, liberal arts and humanities. To achieve some balance on this topic, let’s look at the distribution of majors of students who have earned a bachelor degree. 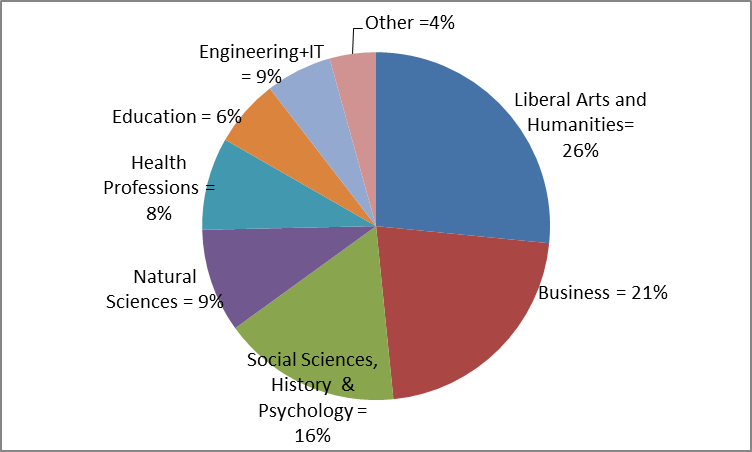 Interestingly, the largest percentage of graduates are liberal arts and humanities majors, with social sciences, history and psychology majors having the 3rd largest percentage. Together they constitute 42% of the bachelor degree graduates. Business majors are another 21%. STEM typically includes Engineering (9%) and Natural Sciences (9%) for a total of only 18% of all U.S. bachelor degrees. By comparison, the percent of 2010 natural science and engineering (first university) degrees awarded in Singapore is 45%; in China is 44%; and in Germany is 30% (NSF, 2014). As Figure 1 suggests, in the U.S., we are heavily weighted towards graduating students who have studied the liberal arts, humanities and social sciences. To support the current and future STEM/innovation global economy and the projected U.S. STEM jobs, we need a more realistic balance between the STEM and social sciences/ humanities with significant increases in the percent of STEM graduates. Encouraging, inspiring and preparing students to pursue natural science and especially engineering and computer science degrees is very much needed. In doing so, we will still have sufficient social science and humanities majors to support the work, teaching and research in these fields. Note in Figure 1, the Engineering sector includes Engineering, Computer and Information Sciences, Engineering Technology and Architecture, for a total of 9% of the bachelor degrees awarded. Only 4.5% of the bachelor degrees were engineering majors. Another 2.5% were computer science majors.